As some of you may have noticed, there was no post last week. I should have had a post ready to go on October 23rd. I wanted to have a post ready. But it was just not in the cards. Someone (at times multiple someones) in my family has been sick at all times for the last almost 2 months. I’m fairly certain we’re recycling the same bug. My FIL refuses to go to the doctor and isn’t getting better so I’m pretty sure he is helping to perpetuate the whole thing. So I have been busy cleaning things almost nonstop; trying to stop the spread of germs, taking care of my sick and well family and my usual daily duties, all while being sick myself. Blogging just wasn’t going to happen this week. This particular bug carries with it an unpleasant, nagging cough. The kind that, once you start, it’s really hard to stop. So I’ve been making my husband, my kids, and myself this lemon honey “tea”. So long as you’re sipping on it the cough stays pretty much at bay and you can carry on with normal life. This also soothes a sore and scratchy throat which is always a nice bonus. This “recipe” is simple enough that you could make a big batch of it for a thermos to take with you to school or work and drink it through the day so you can soldier on, or you can just make it by the cupful while you hunker down under blankets on the couch and wait it out. This “tea” is entirely subjective. Some people drink it with just a tiny bit of honey and a lot of lemon. I can’t stand it that way- too tart. And you don’t get the full benefits of the honey for your throat & cough. So I usually err on the side of more honey. 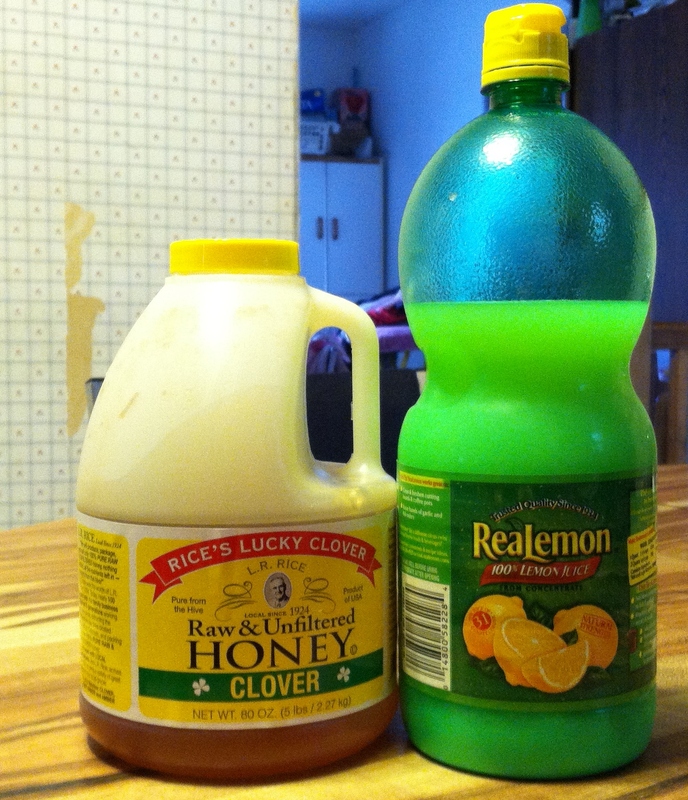 I use 6 ounces of boiling water, 1-2 teaspoons of lemon juice, and one tablespoon of honey. Naturally, adjust those to your liking. Just don’t skimp on the honey too much. The whole point is to soothe the throat and honey does an amazing job of that! In fact, sometimes I just tell my kids to open their mouths and tilt their heads back so I can drop about a teaspoon of honey into the back of their throat. That will calm their cough- so long as they don’t drink anything- for at least 30 minutes. Certainly as long as a conventional cough drop. It doesn’t have to be this brand. Heck- you can use some you’ve grown yourself; it’s easy to grow indoors even. 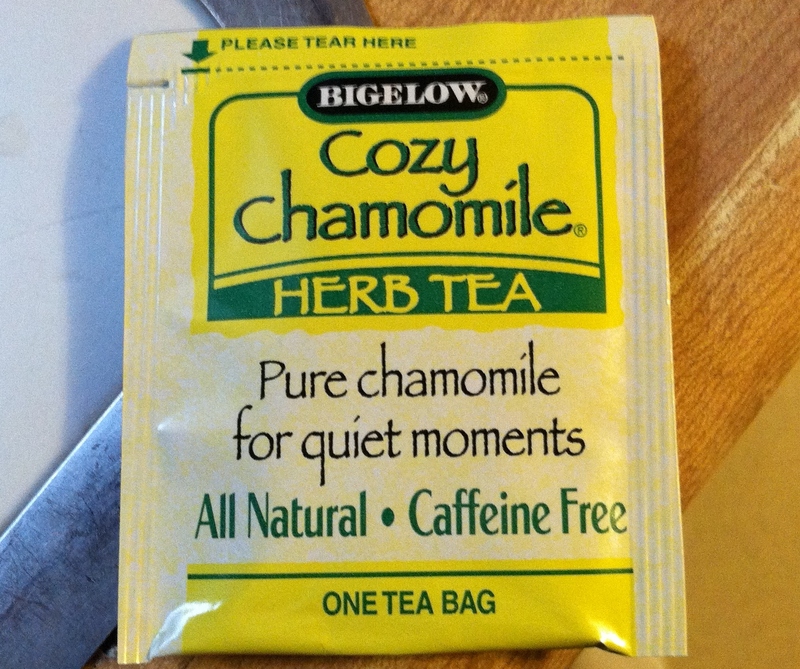 Just make sure it’s caffeine free and 100% chamomile. 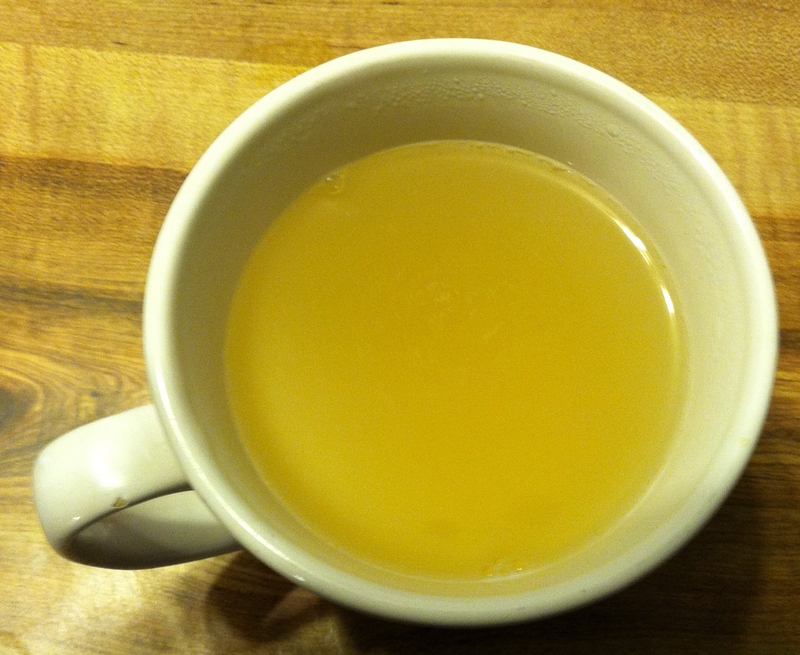 Steep the chamomile in the boiling water for about 3 minutes before you add the honey & lemon juice. Drink it right before bed and it should help ease you to sleep. My husband actually drinks this before bed every night, whether he’s sick or not. It’s been helping to ease his insomnia rather nicely. So there you have it. Now you have a weapon in the fight against cold & flu season and the little germ mongers that bring it in the house (aka KIDS). And this one isn’t loaded with poisons and artificial colorings like the ones you buy from the store. A check in the plus column if ever there was one! Let me be perfectly clear: this is not SOS (Sh*t On a Shingle for those not in the know). I’ve had some try to call it that and I set them straight immediately. They have not made that particular mistake again. SOS is what you get out of desperation when all you have to work with is ground beef, flour, and milk and you have to eat something. I don’t make SOS. And I don’t make anything out of desperation. Ever. So… moving on. 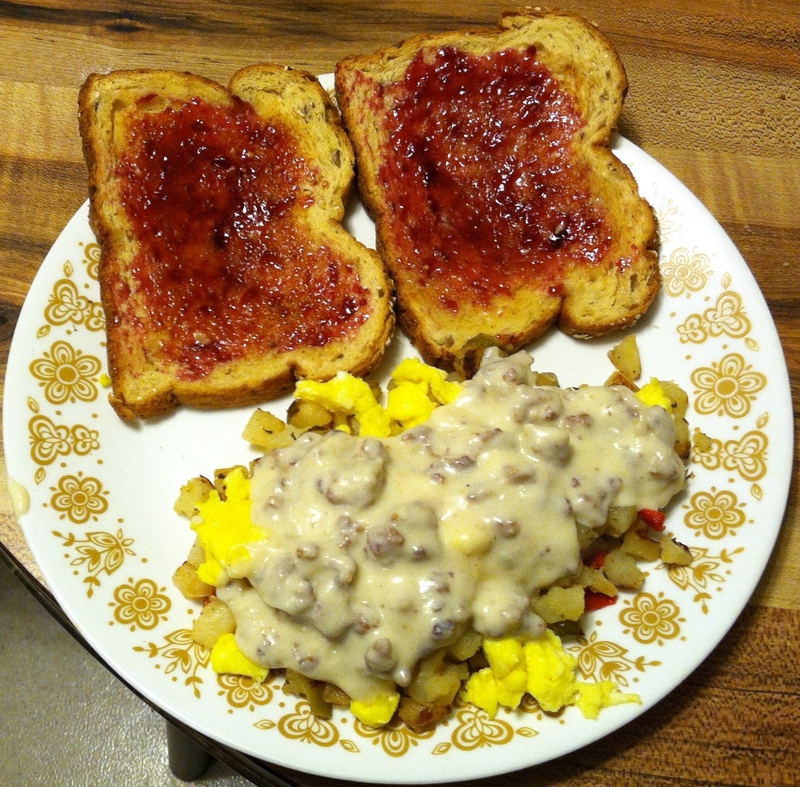 When people try to make sausage gravy at home it usually turns out like most restaurant “sausage gravy” offerings: either soupy or gluey and/or bland. That’s why I thought I didn’t like sausage gravy; too many brushes with it in the restaurant world. Why put something akin to school paste on your breakfast?! 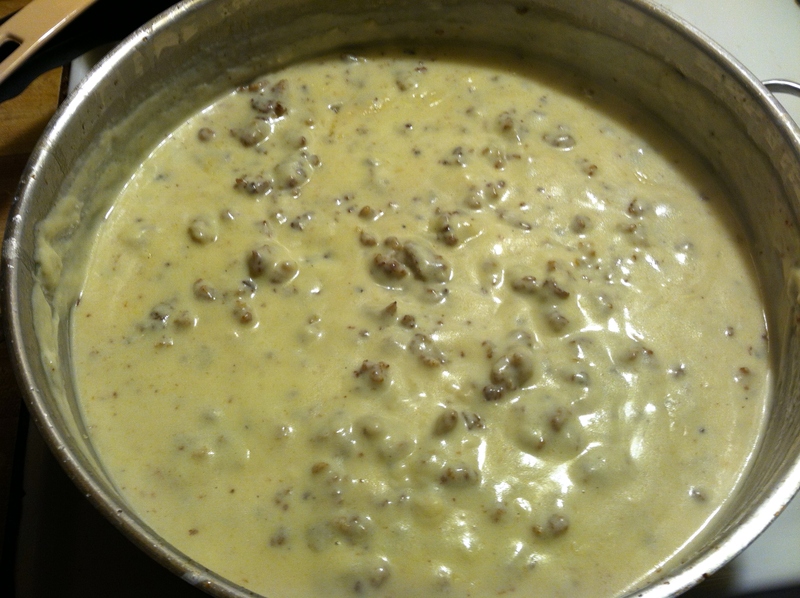 So when my husband, Ron, told me that he liked sausage gravy- the one time he had it when the person who made it knew how to make it well- I set out to make really good sausage gravy. Something that even I would like to eat on my breakfast. This is not even close to what you will get in your average restaurant. This is sausage gravy as it should be: creamy, a little spicy, and oh so comforting over… well, just about anything. Everyone loves it over biscuits or toast. I like it over potatoes. The girls like it over scrambled eggs. And Ron will eat it out of a bowl with a spoon like it’s soup if I let him. Seriously. He’s done it before. It’s that good. Start by browning your sausage. I’ve found that, since people are so absurdly afraid of fats these days, the sausage I buy at the store is getting leaner and leaner. 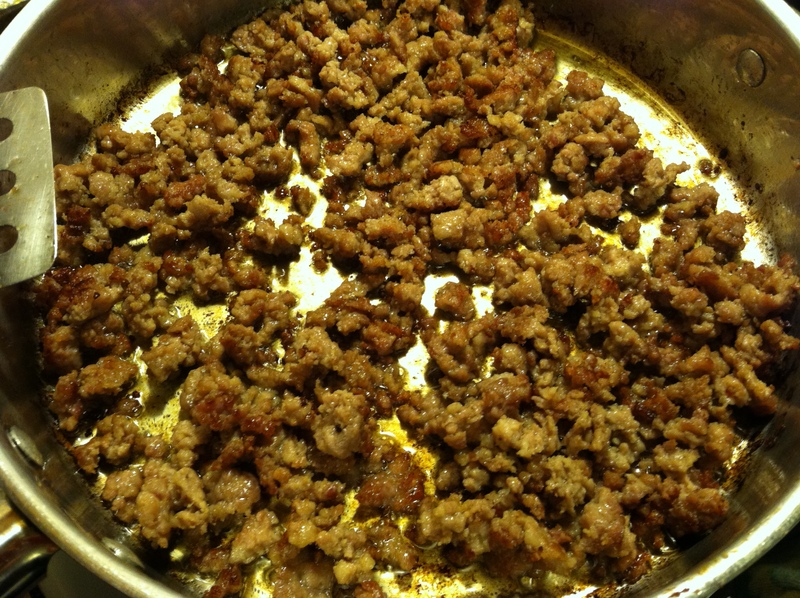 This being the case, I always add some olive oil to the pan along with the sausage. Technically you could use whatever oil strikes your fancy. But I always use olive oil for this. I’ve tried it with other oils and the flavor just wasn’t right. So use what you like or what you have. Anyway, brown your sausage. And when I say “brown” I mean brown. You want some really nice caramelization so that your gravy has the depth of flavor that most restaurant sausage gravy lacks. I’ll let you in on a little secret very quickly… Most restaurants don’t brown the sausage they use in their gravy in the pan they make the gravy in. A lot don’t even cook the sausage at the same time as they make their gravy. The restaurants I made sausage gravy at had me cook up a bunch of sausage patties, chop them, and add them into snow-white reconstituted gravy powder. More restaurants than you know do something like that. And if they use sausage crumbles it’s from a huge batch they were frying up for other things as well- killing several birds with one stone. Which is why most sausage gravy in restaurants is so bland; they contain only small amounts of sausage, and none of the really flavorful bits. Some people insist that you need to remove the sausage and drain it, put the drippings back in the pan, add the flour, and make the roux. I think that’s a waste of time. With this particular dish you don’t need all of those extra steps. I’ve found that adding the flour in with the sausage actually makes mixing the roux easier. When I make the roux without the meat it’s a chore to keep it from clumping when I add the milk. But when I make it with the meat included the roux is more evenly distributed to begin with and incorporating the milk is a breeze! 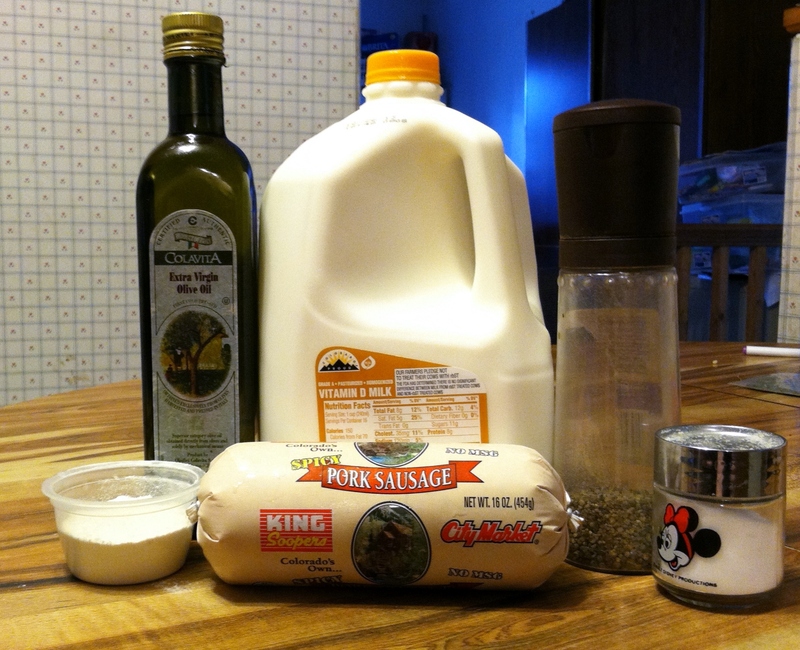 Sausage milk soup. But that’s ok! Bring this to a full boil and then turn the heat down to a simmer, all the while stirring ALL around the pan to make sure you don’t have roux clumping up in the outer edges of the pan or sticking too much in the middle. You can keep using the whisk if you want to, but I switch to a spoon as soon as the milk is incorporated because a spoon can get into the outer edges of the pan much better. Thick, rich country sausage gravy with so much flavor you may never order it in a restaurant again- it would only be disappointing. Now, if your gravy gets too thick for your liking you can simply add more milk- a little at a time- until it’s the desired consistency. Just be sure to taste it again and readjust the seasoning. Very classic, indeed. I put it over toast this time because, being without an oven, I couldn’t make biscuits. So biscuits are best but toast works surprisingly well too! I, on the other hand, prefer something a little different. Do you go to restaurants for breakfast and order the “skillet” meals? You know; potatoes of some kind on the bottom, then eggs- with or without breakfast meat of some kind- then topped with cheese or gravy, with toast on the side. You can make that at home! Cheaper and tastier! See?! Looks almost the same as in a restaurant. It’s on a plate instead of in a cheap fake skillet, and the toast isn’t quite as pretty, but that doesn’t matter because the taste is phenomenal! This is my FAVORITE way to eat sausage gravy. Now that you have a fantastic recipe for it in your repertoire it’s time for you to decide your favorite way to eat it too! 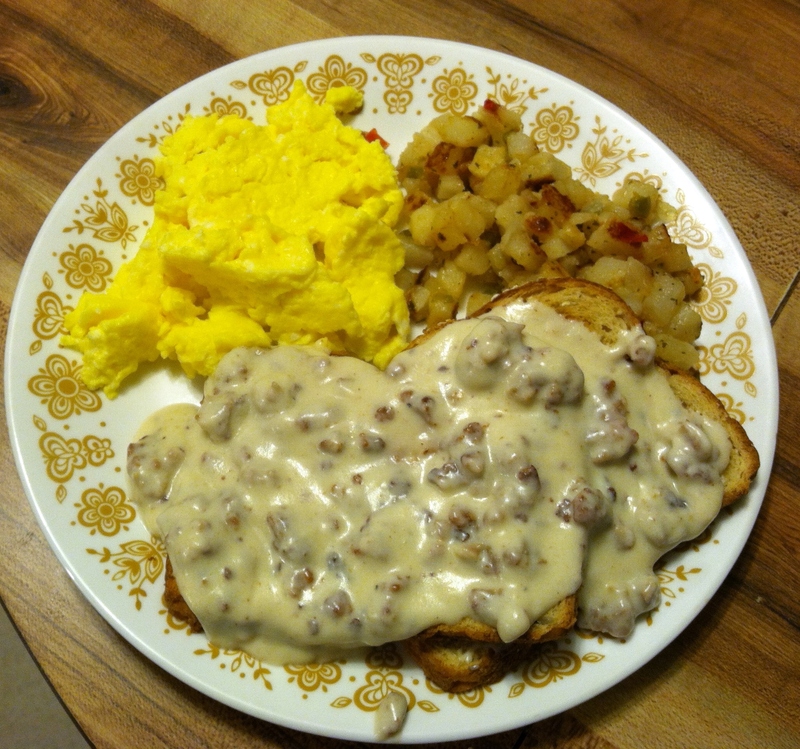 Note: This sausage gravy reheats wonderfully! 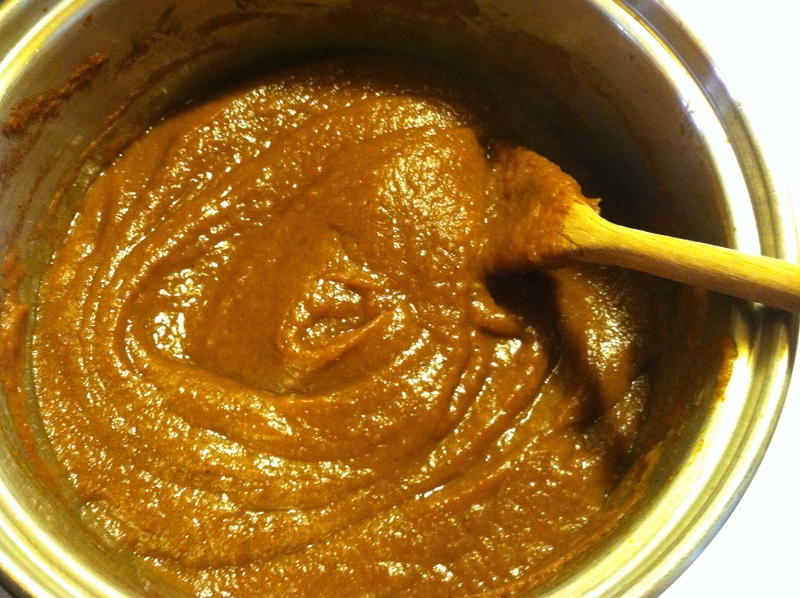 Put desired amount of cold gravy into a microwave safe bowl or a sauce pan. 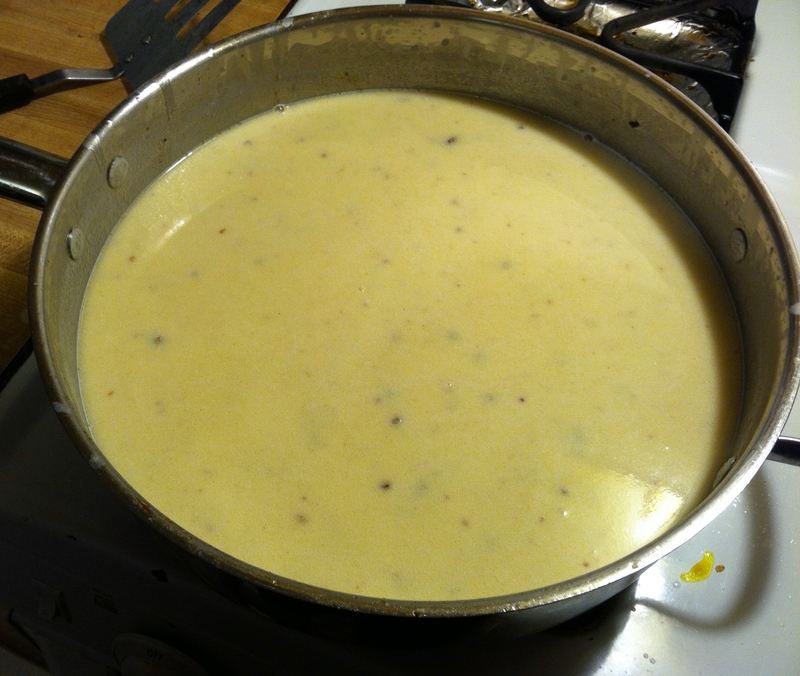 Add a small amount of milk- just enough to be able to stir it somewhat easily, then heat at 45 second intervals in the microwave- stirring after each- until it’s hot or put over medium heat until hot throughout if you’re using the stove top. *Cook the sausage in the oil until it’s nicely browned. *Sprinkle the flour over the sausage in the pan and stir to combine. *Cook, stirring, for one minute to cook the flour. *Whisk in the milk, making sure to get the whisk into the outer edges of the pan to get all of the roux incorporated. *Bring to a boil, whisking or stirring constantly. *Season with some pepper and a little salt. *Reduce the heat and simmer the gravy 5-10 minutes, stirring occasionally to make sure there are no clumps sticking to the bottom of the pan. *When the gravy has reached the desired thickness, taste it and adjust the seasoning accordingly. *Remove the gravy from the heat. If you need to reheat the gravy you can put it back over the heat, but if you let it sit over low heat to keep warm it will continue thickening. As the song says Christmas and it’s associated trappings & trimmings is, indeed, the most wonderful time of the year. But not too terribly long before that is the other most wonderful time: the pumpkin harvest! Like millions of others in this world, I LOVE pumpkin. It’s very good in savory dishes but it truly does shine in the sweet ones. Like it was created solely for pies, breads, cakes, and all other things sweet. And next to apple, pumpkin pie is my favorite. It takes less than 5 minutes to mix up (if you have the crust already done) and it’s smooth, custardy texture is heaven in the mouth. My recipe for pumpkin butter is like pie in a jar that you can enjoy anytime with just a couple of minutes’ preparation. 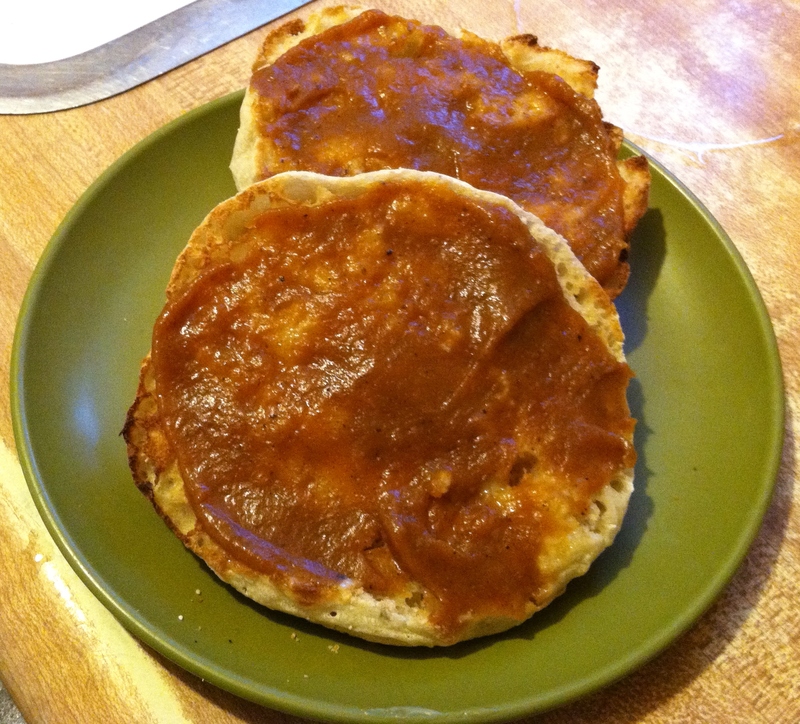 My kids’ favorite way to eat pumpkin butter is on buttered toast for breakfast. But put this over a brick of softened cream cheese and serve with vanilla wafers or pita chips and you have a fun, creative dessert that is perfect for a party. You can use plain apple juice if that’s easier for you to get your hands on, but apple cider adds a depth of flavor that apple juice can’t. But even if you don’t have cider on hand make this butter! It will still turn out incredible! 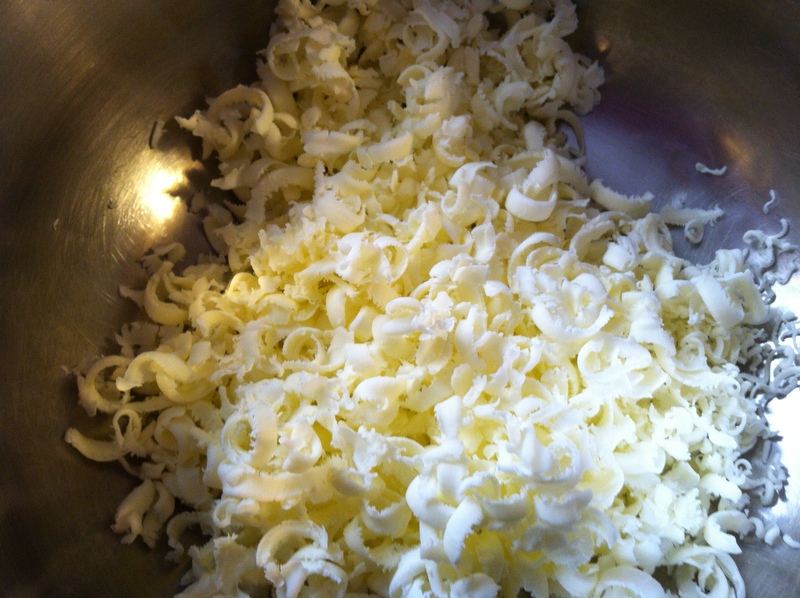 All you have to do is measure the ingredients, pour them in the pan, and stir while the butter reduces and thickens. It really couldn’t be easier! But you do want to stay close by the stove. This is a thick mixture with very little liquid to begin with so you will need to be right next to it to stir it every couple of minutes to start out, and then constantly for the last few minutes or you will have scorched pumpkin butter and no one wants that! 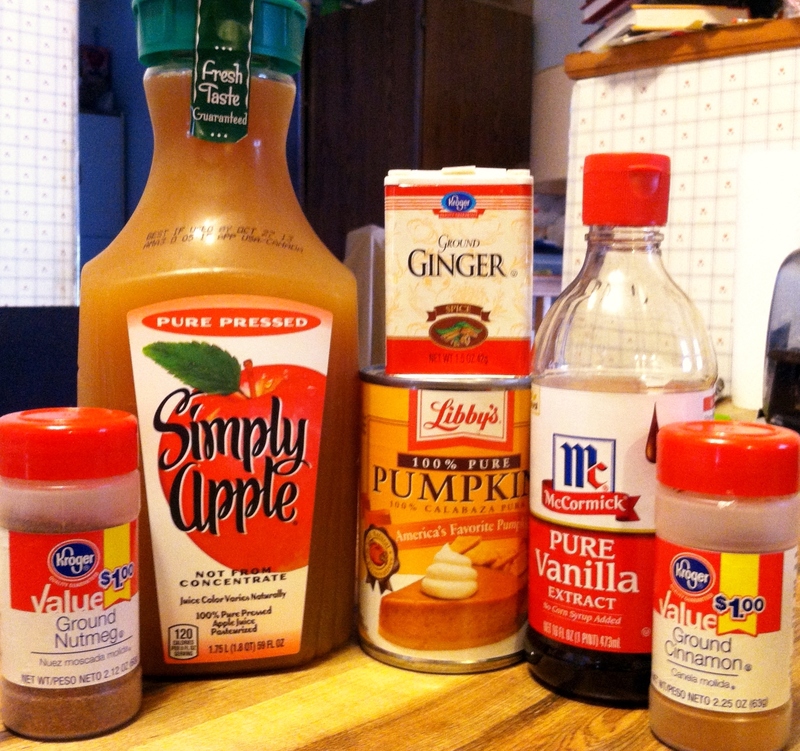 You could add 1/2 t Cloves if you’d like, but I don’t really care for cloves- certainly not in my pumpkin pie. *Put all ingredients into a heavy bottomed saucepan. *Cool and transfer to a suitable container. I use canning jars with lids & rings. *Must be stored in the refrigerator. NOTE: I usually double this recipe and come up with enough to fill 2 pint jars plus about 1/2 C extra. I keep one jar & the extra in the fridge and give the other pint to my parents, who share my love of pumpkin butter. The weather has been blissfully cool and gloomy for the last few days. I’ve been in heaven! And today… Oh, today! It’s cool with a tiny breeze and the sunshine has been gentle and golden; today is a perfect early autumn day. By the time you read this, a few days will have gone by and we could very well be in the 80’s again. So I am enjoying every second of today. We had fire grilled steak for a leisurely lunch and for dessert after an equally leisurely dinner I have apple crisp planned. No, the oven is still not fixed. I have decided to start finding alternative methods of dessert production. 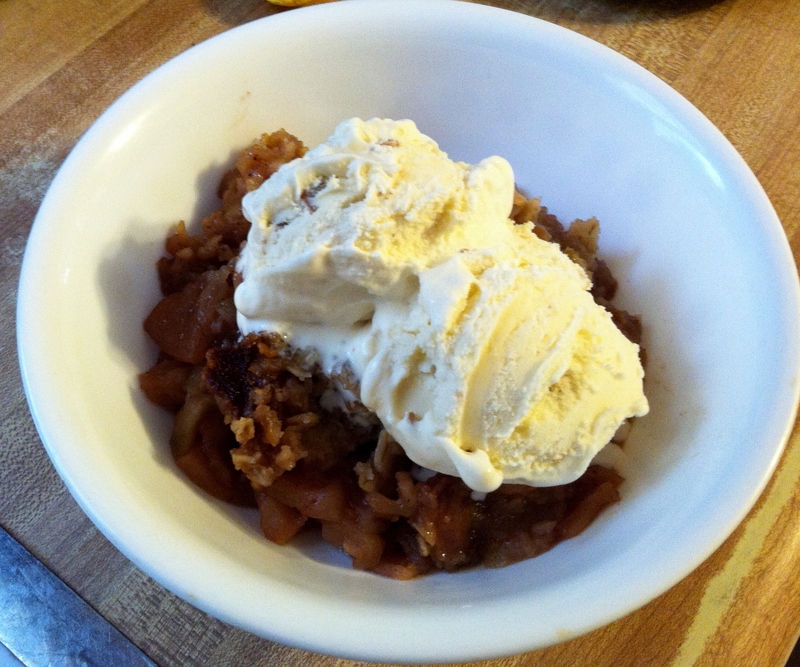 As it turns out, the slow cooker is actually pretty fair at making desserts. I have found several recipes that I will be trying and, probably, posting here. 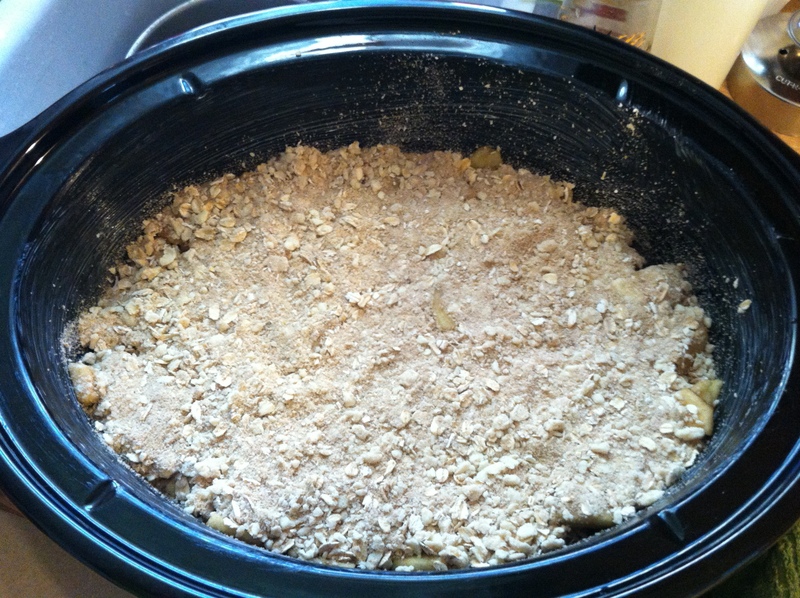 I have been craving apple crisp terribly and decided to try it in the slow cooker. It worked really well! You just have to plan ahead a little more than you would with the oven version because it takes about 4 hours to cook in the slow cooker as opposed to only an hour in the oven. This would be perfect to start in the morning on a weekend day, go do whatever the day has in store, and then come home to for lunch. The smell is every bit as awesome as the oven version and so is the taste! The only difference is the topping. It doesn’t actually get crispy like it does in the oven. But that is really the only “down side” of using the slow cooker. I prefer to use a mixture of tart and sweet apples for crisp. The flavor of the end product is delightfully intriguing and you get the added bonus of not needing to use as much processed sugar because of the sweeter apples that are included. The apples I chose this time are Granny Smith and Galas. You have to make sure you choose nice, firm Gala apples for cooking or baking. Sometimes Galas can be mealy and those won’t hold their shape when cooked; they’ll just turn to mush. To find a firm Gala apple, give it a light flick. If the flick produces something akin to the sound you get when you bite into a crisp apple you’re in business. If the flick produces a sound akin to a dull “thump” then you have a soft and/or mealy apple that you don’t want to use. Put the lid on and cook the apple crisp for about 4 hours. 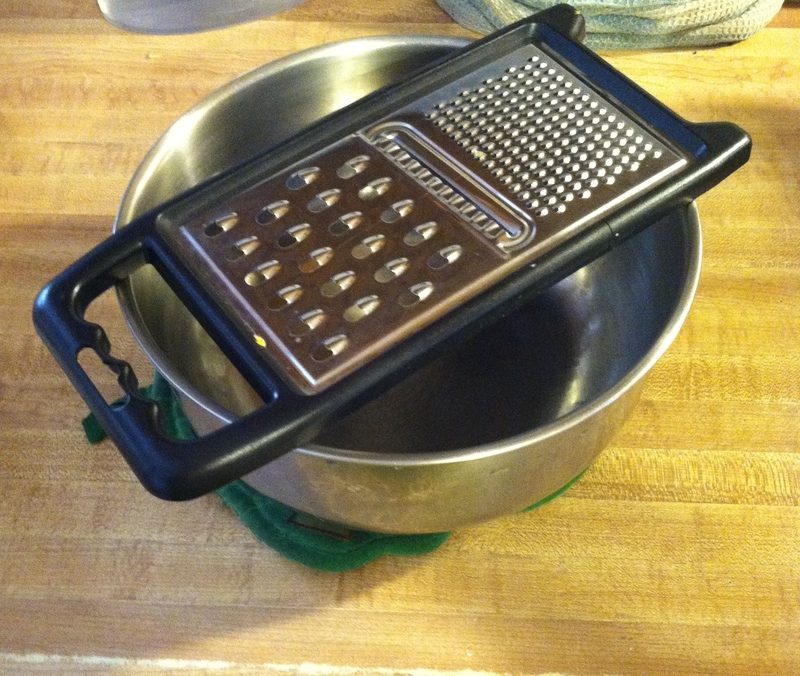 If you’d like, you can take the lid off for the last 20 minutes to firm up the topping a bit, but it’s not imperative. It will be tasty either way! The result is awesome! So long as you don’t cook the crisp any longer than about 4 hours, the apples will have great texture and the flavor is wonderful. The only “problem” I have with this method is that you end up with a little bit of runny liquid in the final product. With the oven method the syrup or juice boils down into a nice thick pie-filling type thing. That can’t happen in the slow cooker. There isn’t a lot of it and if you stir the apple crisp up in the bowl you eat it out of you really don’t notice it. But if that’s a turnoff for you, you could just add 1 tablespoon of cornstarch to the apples when you mix in the sugar & spices. Now that Autumn is officially here I am so excited to start eating the foods of the season- and this is the perfect way to start! Next week I will be bringing you another quintessential food of fall; pumpkin! But I promise you: this is NOT the typical pumpkin treat. This will take pumpkin pie to a whole new level- and make it perfectly acceptable to eat for breakfast! And no; it’s not yet ANOTHER muffin or bread recipe. Stay tuned! *Butter or spray the crock of a large slow cooker (mine is 6 quarts. Anything smaller than 4 or 5 quarts is too small). 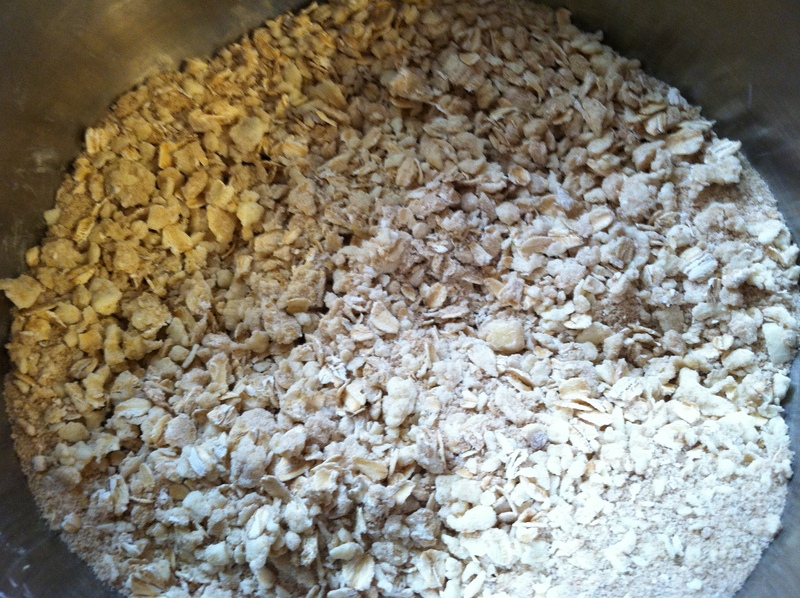 *Combine the flour, oats, and 3/4 C of the brown sugar. *Cut the butter into the flour mixture and set aside. 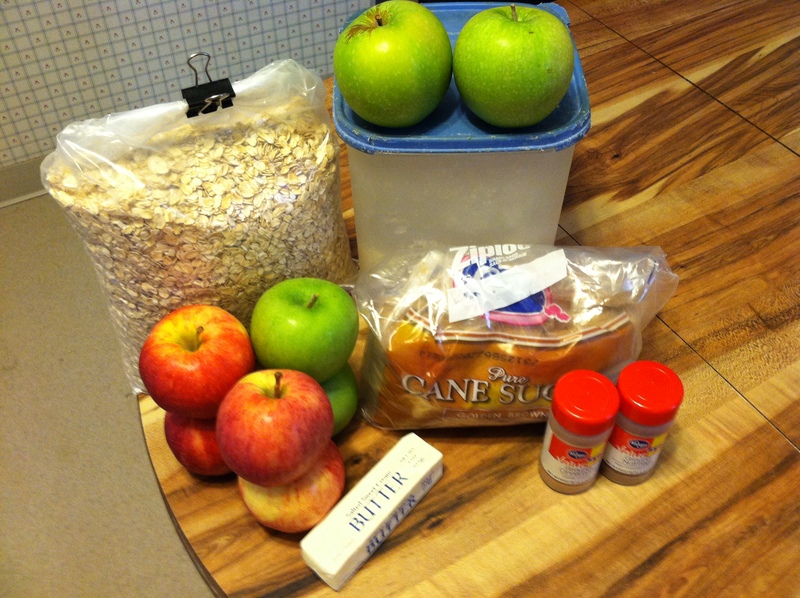 *In a large bowl, combine apples with the remaining brown sugar and the spices. *Spread the apples evenly in the crock, followed by the topping. *Pack the topping very slightly onto the apples. *Cover with the lid and cook on high for 3 1/2 to 4 hours. 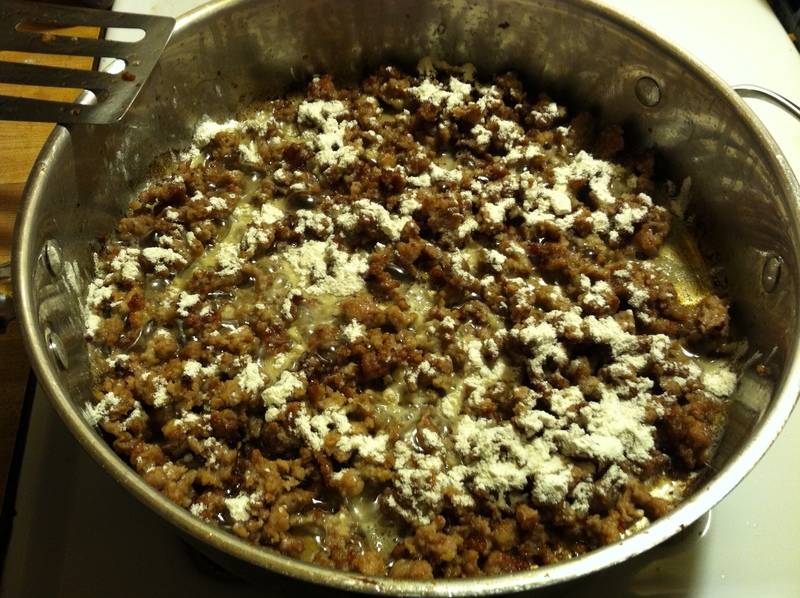 *If desired, leave the lid off for the final 20 minutes of cooking to firm the topping up a bit. *Garnish with ice cream (seriously- butter pecan is incredible with this! ), whipped cream, or eat as is.